A lot of homeowners remove their carpet and install hardwood flooring with the thought of "healthier living in mind" and it's "maintenance free and easy to clean". While that's true - what happens if you live in or purchased a home that already has hardwood floors? How well were they maintained? What types of cleaners were used on them previously? Why do my floors look like there is a film on them? Why does my floor look like the finish is dull? Why after I wash them do I see footprints on them? Why do they look all scuffed? Will I have to refinish them? These are common questions we are asked on a daily basis. 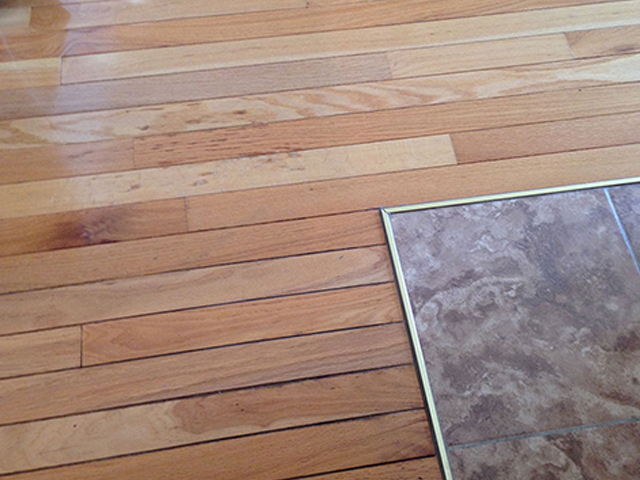 As long as there are no deep scratches in your wood floors, chances are they just need to be cleaned professionally. Certain cleaners leave a sticky residue on the floor attracting dirt from daily wear and tear, which causes a build up, hard to remove by just mopping. At Go Green with our equipment, hardwood floor grime fighting solution, buffing process and fresh water rinse, we can remove years of buildup and neglect, without harming your floor or its finish. Our process will even remove surface scratches.